KC Buzianis and Mikala Kanehe (in pink) lead the hike transporting plants and supplies for planting in a newly cleared area in the D.T. Fleming Arboretum. Forty weekend participants helped haul prunings and plant native trees and understory. Despite flash-flood warnings over all Maui the weekend of Oct. 12, the Girl Scouts of Troop 770, 772 and 923 kept their plans for a two-night campout at Puu Mahoe. They were rewarded with a “puka of blue above Puu Mahoe,” reported campers, while most of leeward Haleakala — Kula to Kanaio — rained. The weekend included volunteer service projects in the D.T. Fleming Arboretum, a badge award ceremony, badge projects and games. 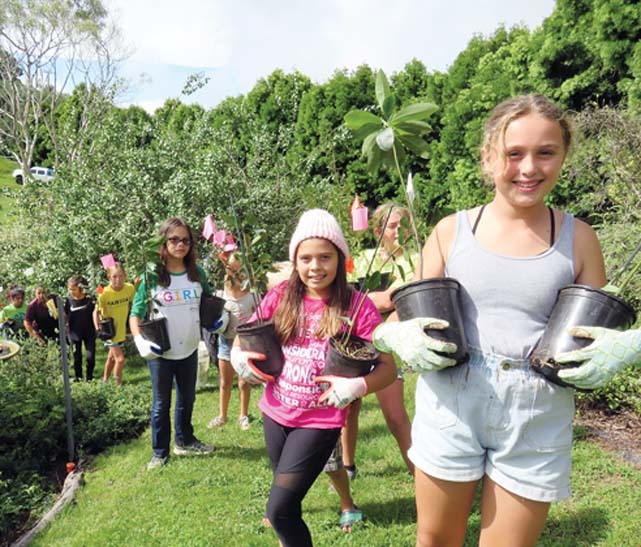 Forty girls, along with their families, hauled prunings and planted 60 native trees and understory, reforesting a newly cleared area in the arboretum. 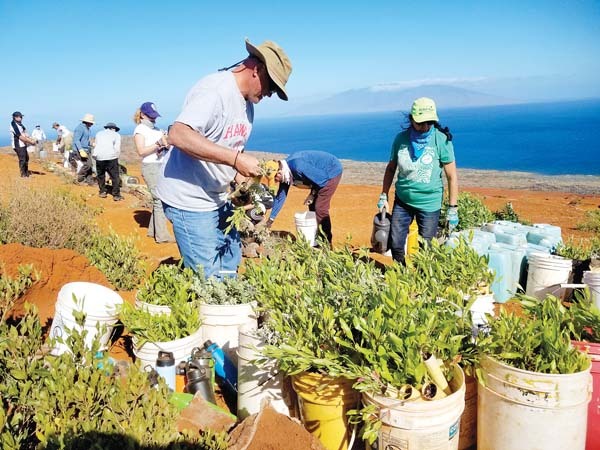 The arboretum welcomes community group partnerships in the preservation of some of Maui’s rarest species and the restoration of South Maui’s native forests. For more information about the D.T. Fleming Arboretum, visit www.flemingarboretum.org. The recipients of this year’s awards are Robyn Valle (from left), Bailey Kahealani Miyoshi Dalzell, Krystal-Andre Ho‘ohiwahiwa Kalima, Liliola Vehikite, Mauliola Gonsalves and Erica Pilotin. They were honored June 30 during a dinner at Ka‘anapali Beach Hotel. County officials Erin Wade (from left), redevelopment program planner; David Yamashita, senior parks and recreation planner; Brianne Zanin, parks and recreation deputy director; and Keith Regan, managing director, are shown with their Hawaii Chapter of American Association of Landscape Architects award.